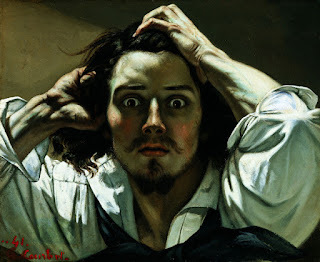 Courbet: "The Desperate Man." Decidedly not normal. This thing that I could not do was a rather important home maintenance project. I think the person added the "scholar" bit because he or she felt that he or she had insulted me. In truth, saying I am not a normal person is, as far as I am concerned, a compliment of the highest order. I treasure that status. The problem in all of this, though, is in an age-old misconception: that "normal" is reflected in the people with whom we are generally surrounded. It so happens that this person is routinely surrounded by many mechanically capable chaps who not only do home maintenance but who even do such things professionally. But one's proximate world is not necessarily a clear reflection of normalcy. If I hang around with only guys who wear Richard Nixon masks and who sing show tunes to their goldfish on Sunday afternoons, I might easily see that as normal. The weirdo would be the guy who sits and watches football on the couch with a frosty barley treat and a bowl of chips. Truth is, I'm willing to bet that most of the men in the world would not have undertaken this project (moderate in difficulty, though it may have been) that this person feels any "normal" people would do. And, in a way, it sort of diminishes the talent and/or skill of the guys who can do this stuff, to sum it all up as "normal." I respect those who can do these things. I wonder if they respect my ability to plausibly explicate Ezra Pound?